In 2009, Japanese researcher Jiro Sakaue of the Southern Marine Laboratory made a sensational ichthyological discovery, arguably the single most important find since the coelacanth was first hauled up some 70 years ago. 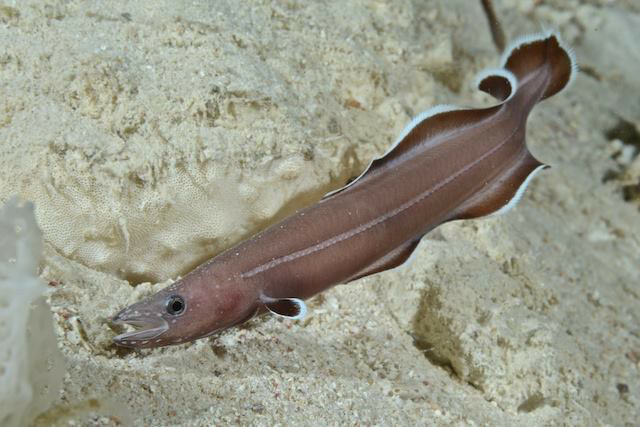 While exploring underwater caves in Palau, a small, elongate fish caught his eye. It measured less than two inches in length and was so docile that he was able to collect it by hand… literally, with his hand. The species he found that day was like nothing else known to science and would soon make headlines around the world as a “living fossil”. Described in 2011, Protanguilla palau was easily recognizable as belonging to the Order Anguilliformes, home to all the true eels, but, at the same time, it was unlike any other known family. It possessed some truly bizarre features by eel standards which forced its authors to erect an entirely new family for this fish. 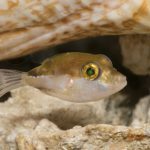 When they examined its genome, they got an even bigger surprise: this unassuming eel formed its own distinct group at the very base of the eel phylogeny. This was, in a sense, the most “primitive” living eel. Some context is needed here. Among the ray-finned fishes, eels (along with their relatives: tarpons, bonefishes, ladyfishes, and halosaurs) comprise an ancient lineage thought to be the sister group to all other extant fishes. In finding Protanguilla, the veritable ur-eel, we had suddenly stumbled upon a distinct branch in the fish tree of life that stretched back more than 200 million years. It was in the Late Triassic—a period when dinosaurs were only first making their mark upon the planet—that the ancestor of this fish split off on its own evolutionary tangent, which apparently survives today thanks to this one species. So what is so special about Protanguilla? For starters, it has a premaxilla bearing a small patch of teeth. This very important bone is found at the tip of the upper jaw in most bony fishes (as well as the amphibians, reptiles and mammals that descended from them) and tends to be quite highly modified in some of the more “advanced” fishes, like teleosts. We find the premaxilla present in some of the earliest fossil eels, but it’s entirely absent from all other living groups. 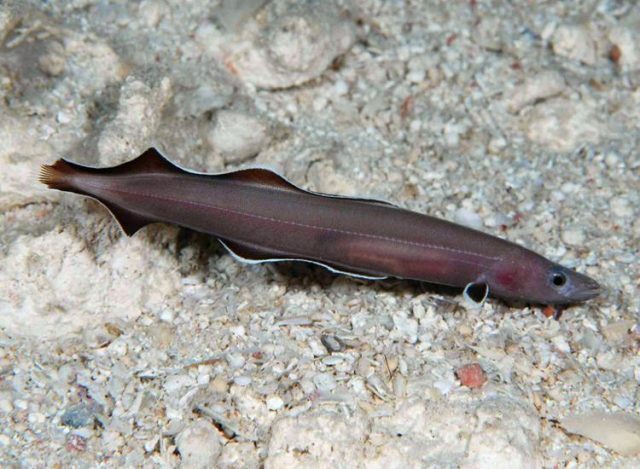 Similarly, Protanguilla is the only eel, living or fossil, with well-developed gill rakers. These are the small protrusions found on the individual gill arches which help to capture food as water is passed out the gills—most other fishes have these, including the closest relatives of the eels. As far as eels go, Protanguilla is not terribly anguilliform in its overall shape. 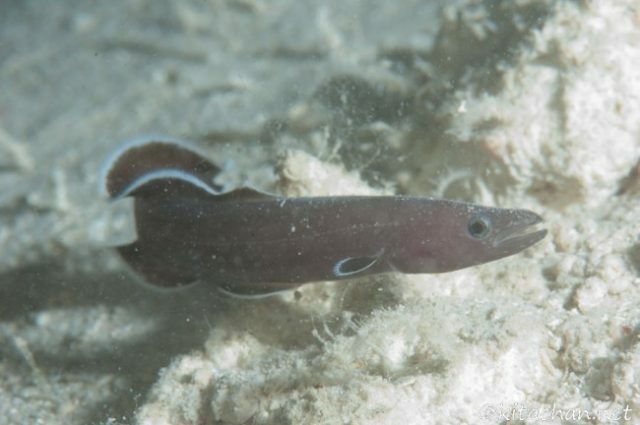 The markedly low vertebral count (<90) is in stark contrast to that seen in most other eels, giving this fish a somewhat stockier appearance compared to the highly elongated body found in your average moray. 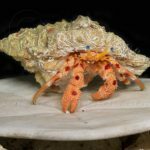 In total, there are around a dozen major diagnostic traits which support this “living fossil” as being the oldest living relative in the order. 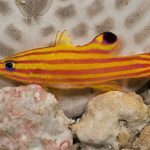 We still know very little about the biology of this fish or the purpose for its many unique features. To date, it is still known only from the caves of Palau, at depths of around 35 meters. The holotype specimen was a large female measuring seven inches (seen in the video above), but all other specimens have been juveniles under two inches in length. There’s unfortunately no information concerning the diet of this fish, which makes it that much harder to understand what role the unique gill and jaw morphology serves. 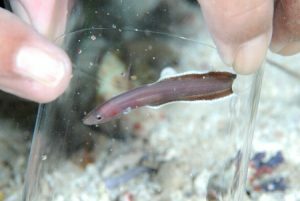 Is it possible this eel is filtering out small planktonic organisms with its gill rakers, or does it still feed in the usual eel manner on things like shrimp and small fish? 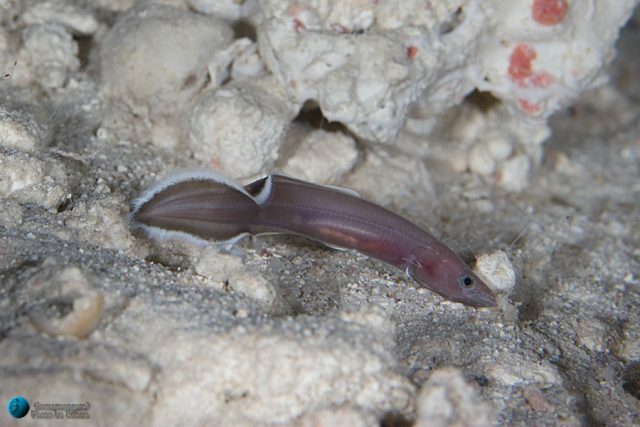 There’s so much more left to discover about Palau’s curious cave eel. Where else in the world can we find this relic? It’s surely not restricted to just this one small cave, but is this a widespread species in the West Pacific, the Central Pacific, the Indo-Pacific? 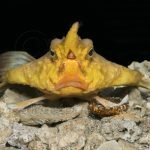 And why did it take so long to stumble upon it if it occurs so shallowly—perhaps this fish normally favors deeper waters? Some recent genetic studies have even called into question whether it’s quite as distinct as the morphology would suggest, suggesting instead that it forms the sister group to the deepwater Cutthroat Eels (Synaphobranchidae). Hopefully answers to these questions will be forthcoming in the near future. Of course, one of the best ways to better our knowledge about Protanguilla would be for a specimen to find its way into a public aquarium somewhere. Surely, if we can collect Centropyge abei, we can get one of these weird, little eels into a net.